The Renaissance represented a huge shift in thinking which heralded the dawn of new perspectives, literally and figuratively. The idea of perspective itself was unknown until then and it established a method of recording differences in viewpoints between one thing and another. Perspective was a mathematical means of making the human eye aware of co-existences. 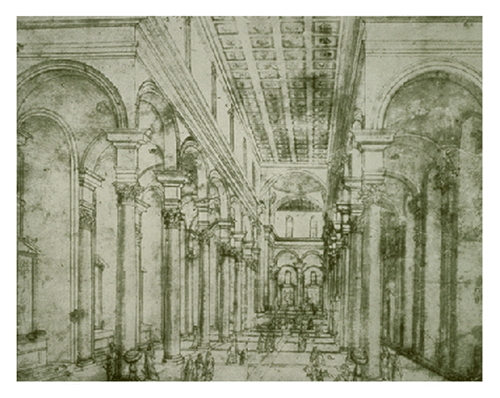 ‘Brunelleschi’s experiment’, the Florence Baptistry, which he began in 1420 C.E., was the first incidence where perspective was used to draft architectural design. This picture above is one of Brunelleschi’s groundbreaking perspective drawings for the Church of Santo Spirito in Florence, completed around 1428 C.E. Until this time our sense of the world was planned in two dimensions. Now our vision of it became deeper and more dynamic. The adoption of the lens of perspective had a profound and significant effect on humankind well beyond architecture. It was to play a pivotal part in the next chapters of human civilization and many of the ideas emerging during the Renaissance and the age of Enlightenment continue to have huge influence on the world today. The development of perspective enabled three-dimensional engineering. It fostered the seeing of objects in relationship to one another and the establishment of relative perspective has become a mechanism from which we’ve created comparisons. Embedded as it now is into our thinking, perspective has developed impressions of unique and individual value as part of inter-relationships. It’s also at the root of how we form a mental sense of competitive advantage. In the late 14th and early 15th centuries, Italian Florence was at the heart of the Renaissance and a number of artists there introduced the depiction of perspective into their painting, including Giotto, Masaccio, Mantegna, Fra Angelico and Leonardo da Vinci. In 1435 C.E., Leon Battista Alberti’s manuscript, ‘On Painting’, was ‘the first modern analytical study of painting, a pioneering treatise on the theory of art’. It became the classic text that essentially defined how to use linear perspective for artists. It codified and defined perspective as a new artistic standard, and this created a monumentally different approach in artistic works and how they communicated. 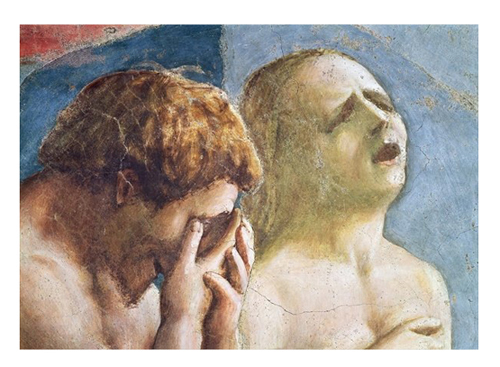 In the Renaissance, emotion was documented visually for the first time. This was another step change that opened up new human perspectives. The art of this period developed the means to both express feelings and recognize those of others through that most human condition of all, empathy. So began the first stirrings of emotional intelligence. So these frescoes focused on making a connection with the human spirit and on an exploration of understanding and meaning. 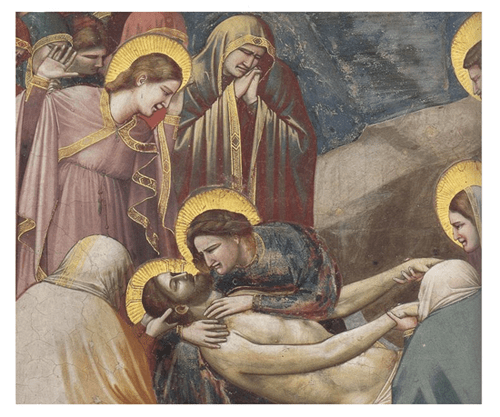 Giotto was using art as a social medium to open up new horizons and move people as never before. 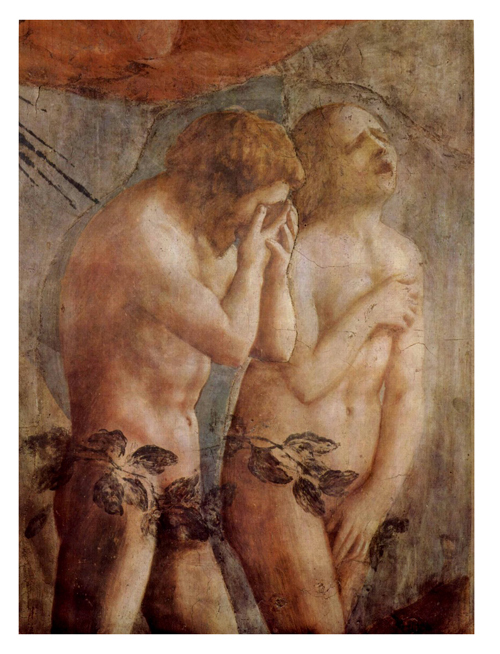 In another landmark moment in recorded art history, when Masaccio portrayed the deep grief and emotion on the faces of Adam and Eve in his work ‘The Expulsion from the Garden of Eden’ in 1425 C.E., a new threshold in the depiction of the human condition had been crossed. With the arrival of perspective and expression, the human being changed from merely having a two-dimensional existence within the historical narrative. Individuality became recognised, feelings were discussed as having value. The human condition became a subject for deeper enquiry and exploration. It’s an enquiry that we need, as digital humans, more than ever today.